This is one of the unfortunate events that I mentioned. I am finally able to talk about it. In December I decided that my heart was okay with getting a new cat. I wanted an older cat. Someone who was laid back, a go with the flow kind of cat. I decided a senior male cat would be just the ticket. Someone just like Icky. I scoured petfinder.com looking for the perfect cat that would counteract Nike's special neurosis. There were a few that I thought could've fit the bill but none that jumped out at me. And so on December 30th I may have accidentally gone into my local Humane Society. I promised myself I was only going to look. I cried as soon as I stepped into the room with cages stacked one on top of the other, three high, lining the walls. I wanted to take every last one of them home. My heart was breaking as I remembered the day I went to the Humane Society and Icky, that tiny ball of furry love, picked me out. An employee asked me if there was anything they could do to help me and I explained what I was looking for. He told me that the senior cats (7+) were in special rooms and that I needed to fill out paperwork in order to go into the rooms and visit with them. Paperwork filled out, I entered the first of the Senior Rooms and there he was. I sat down in the chair and he immediately jumped up on my lap. A few of the other cats came around and I petted the ones that did but, he never left my side. I stepped out and went to visit the other Senior Rooms and he sat by the glass door watching me the whole time. My Beloved, on his lunch, called me and hearing the cats meowing in the background patiently asked "So, we're getting a new cat?" I assured him "No, no. I'm just visiting. Getting a lay of the land." He repeated himself, this time as a statement, "so, we're getting a new cat." It's a good thing they have boxes of tissue everywhere because I cried and cried as I thought of Icky and finally admitted to myself that I was going home with one of the senior cats. And I had to choose. 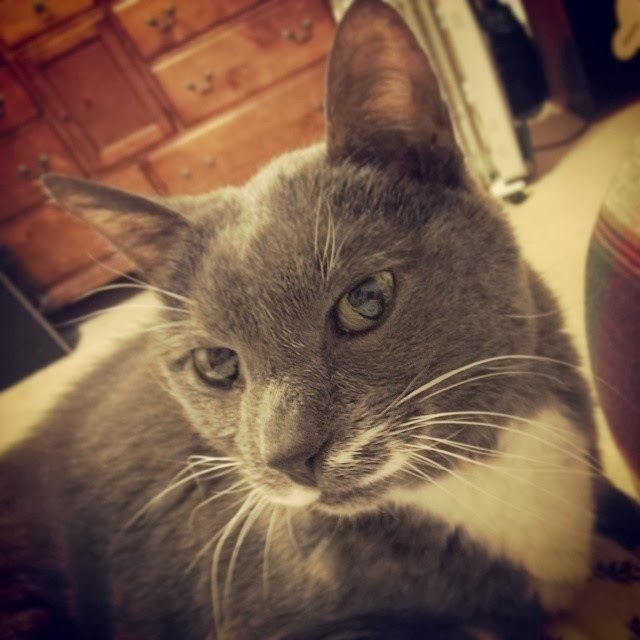 I sent my Beloved a text saying that he had better come up with a name, as Smokey 3 (they obviously had two other Smokey's there) was not acceptable. I said only "He's gray and white". I didn't hear back from him for a few hours and when he did text me it was "On my way home to meet Gandalf the Gray and White". We kept him separate from Nike in the library for week, she never really got used to him but there was no fighting or posturing, just a few hisses from her on the first day. When he was finally released she kept a very wide berth of him. He was Mr. Cool and all "hey, whatup. I'm going to go sit over here." He wasn't much for playing, just hanging out. He would sleep in bed with us, right next to our noggins. Exactly 3 weeks to the day after we brought him home I took him to the vet. Something was very, very wrong with guy. Saturday and Sunday he hadn't moved. At. All. Hadn't eaten, hadn't had anything to drink, hadn't gone to the bathroom, nothing. The vet was alarmed when she came back with his lab results. She said she wasn't sure he was going to live. She asked to keep him for a few days, for IV's and the like. They kept him for a week. I called every single day. I stopped by to visit him in his hospital cage. He was hooked up to an IV 24/7 and they had to force feed him. After a week he came home with me, things were looking up. For the first few days he was okay but he quickly started refusing to eat or drink. And so, five weeks to the day that I brought that sweet boy home my Beloved and I went back to the vet and there, the three of us decided that Gandalf wasn't ever going to get better, that he wasn't feeling well and his quality of life wasn't going to be good and it wasn't fair to him. I am glad that at the end of his life, for five short weeks, he was here, in my home, being loved. I am sad that I never got a chance to really get to know him. 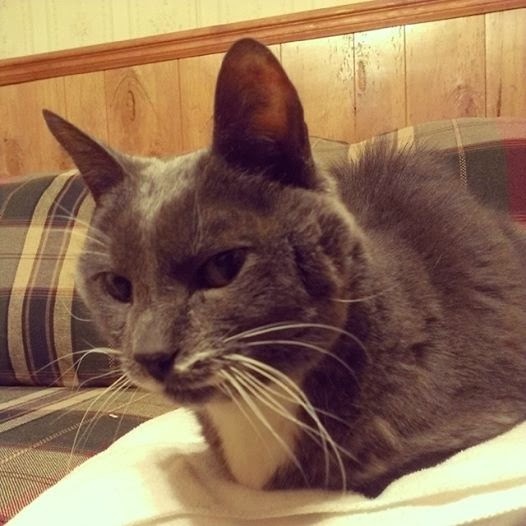 Farewell Gandalf the Gray and White you were a great cat even though we didn't have a lot of time together.